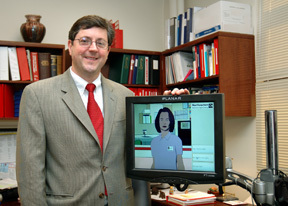 Dr. Brian Jack, PI of Project RED and Elizabeth, Virtual Patient Advocate. Louise is one of our Virtual Patient Advocates. In concert with the After Hospital Care Plan, Louise assists the Discharge Advocates in teaching patients about components of their care, such as their prescribed medications, follow-up appointments and diagnoses. Louise was created based on the communication styles of nurses, which patients are receptive to. Her dialogue is tailored for each patient based on the information entered into the workstation. Currently, the effectiveness of Louise is being tested as part of the RED-lit project. You may click on any of the video files below to see a demonstration of how Louise helps patients become better prepared to leave the hospital. The articles and fact sheets below also provide a more detailed overview of how Louise was created and what her capabilities are. To play the following Flash videos, roll your mouse over a video and click the play button located on the bottom left corner of each video screen. To open a larger version of this video (as a M4V), click here. Funded by the Agency for Healthcare Research and Quality, National Heart, Lung and Blood Institute, the Blue Cross Blue Shield Foundation, and the Patient-Centered Outcomes Research Institute.